I love the new Mosaic punch from the 2013-14 Catalog. It co-ordinates perfectly with the Mosaic Madness stamp set and Modern Mosaic embossing folder and the Quatrefancy Specialty DSP. That's a lot of co-ordination! BUT, did you know you can use it to create other beautiful embellishments for your projects? 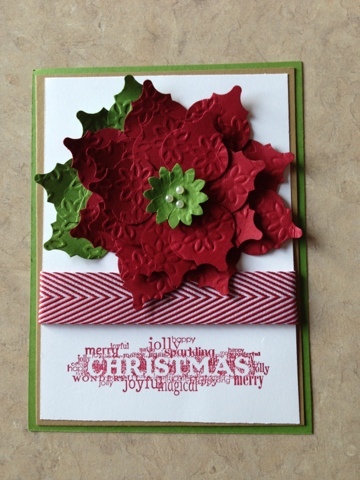 Check out this beautiful Christmas card made by Karen Marcotte. She used the punch to create the focal point, a large poinsettia. Do you see it? Each petal is punched and gently curled then placed with care. The card features the new Chevron Ribbon and stamp set, Seasonal Sayings. To learn more about the Mosaic Punch or any of the products seen here, send me and email or place an order online. To book a punch art party to learn about the other wonderful projects you can make using punches, contact me.